In this image, North is up. This image is cropped to 42% of the original full frame. Software Used Images Plus 4.5 for camera control, calibration, stacking, digital development, noise reduction, smoothing, and Lucy-Richardson deconvolution. Photoshop CS5 used for levels and curves, saturation adjustments, star shrinking, noise reduction, high pass filter, and color correction. Carboni Actions for additional saturation adjustments, noise reduction and smoothing. Registar for image alignment. Notes I employed some new processing techniques with this image which allowed me to bring out some nice fine details. This photo was taken when the Moon was about 70% of full. As a result, it doesn't capture the faintest parts of the galaxy. 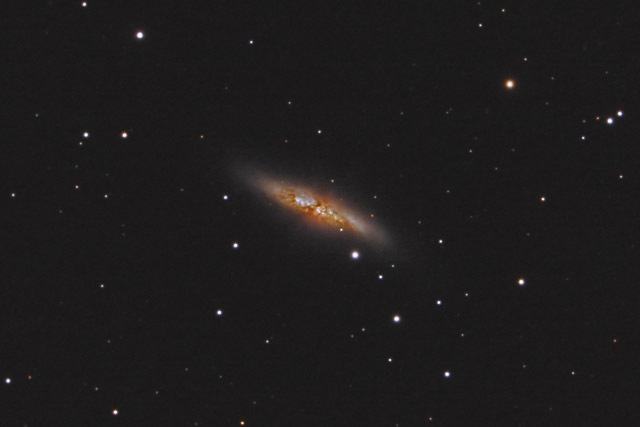 Nonetheless, the image shows the galaxy fairly well.